I think of The Clever Coffee Dripper* as an essential Mac accessory because it makes the coffee that fuels this here website (and a lot of other stuff that keeps me up all night.) 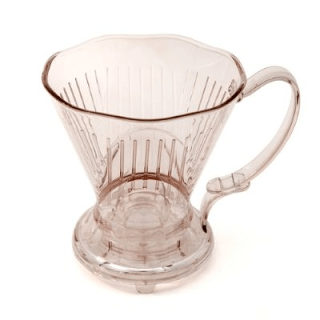 The beauty of The Clever Coffee Dripper is the water doesn’t just run though the cone and into your cup. Instead, it stays in the Dripper, steeping as it were, until you set it down on top of a cup, which activates a valve, releasing the brewed coffee. The longer it steeps, the stronger the coffee, and you will quickly figure out how long is just right for you. It comes with a coaster and a lid. The coaster keeps the counter from getting any stray drips, and the lid keeps the coffee hot while it’s steeping and after you’ve served the first cup. I get two medium-sized cups out of a full cone of water, and the second is almost as hot as the first. Ridiculously easy to clean and the coffee is fantastic. Mom likes it too. We both say “go get one.” The Clever Coffee Dripper takes a number 4 paper cone filter,* so order some of those too. I also like the Aeropress. * Dad introduced me to this one. Perfect if you want to make one really great cup of coffee at a time.